Up until now, you couldn’t pay me to eat a raw beet. Cooked beets, I love. But to me, raw beets smell like the earth. The earth smells like dirt. So I’ve only assumed that raw beets taste awful, yet I’ve never actually tried them. 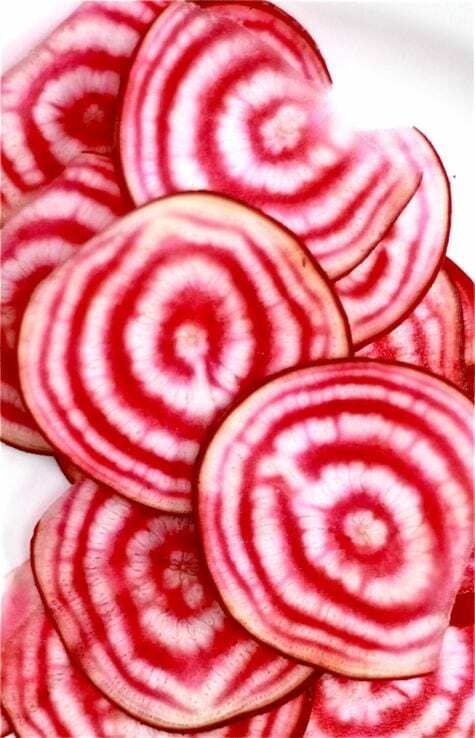 Meet Chioggia beet; the hypnotizing, mesmerizing, candy cane beet. It’s an heirloom variety from Chioggia, Italy. Apparently, when you cook them the swirls will blur together. So if you want to maintain its natural beauty, you should try them raw. Here’s what I did- I made a salad of thinly sliced beets and apples. I added some fresh basil, a handful of mixed salad leaves, and topped it off with a goat cheese dressing. The verdict? Delicious. 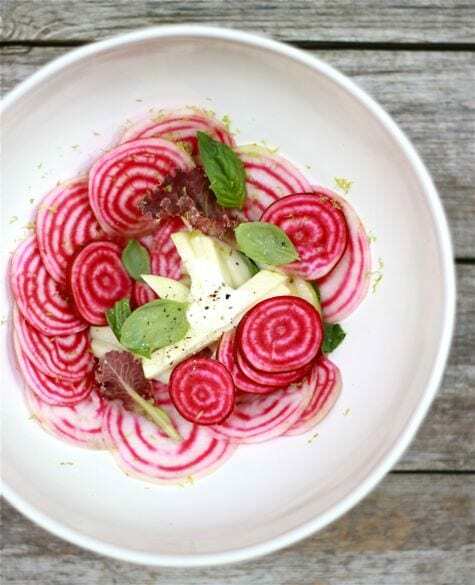 Raw Chioggia beets do not taste like dirt. Believe it or not, they actually taste very mild. Almost milder than cooked beets if that’s even possible. The flavor and texture is so unique I can’t compare it to anything, not even itself. The key to this dish is to slice everything as thin as possible and let it marinate in the bowl for a bit. Using a mandolin is perfect for this. The acidity from the dressing softens the beets, kind of like coleslaw. If it’s too clunky, it’s going to be too crunchy. 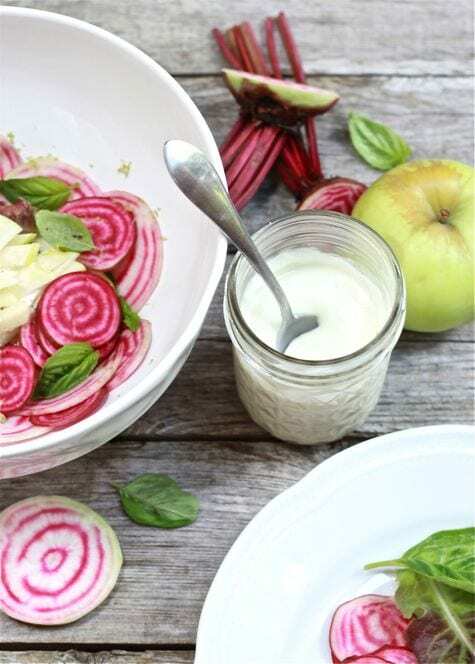 Overall, I really enjoyed this raw beet and apple salad (and so did my herbivore mom). It’s nice to eat something satisfying yet different for a change. Hope you’re inspired to take the plunge! For the dressing: Zest your lime and reserve it for the salad. Blitz all of the salad dressing ingredients in a mini food processor (you can also do this by hand with a whisk and room temperature goat cheese). Season with salt and pepper to taste. The flavor should be tangy with a hint of sweetness. For the salad: Get yourself a large bowl. Trim and peel your beets with a vegetable peeler. If the tops look good, wash them and save for stir frys and salads. Thinly slice with a mandolin. Thinly slice your apples and keep them stacked. Cut vertically into matchsticks. 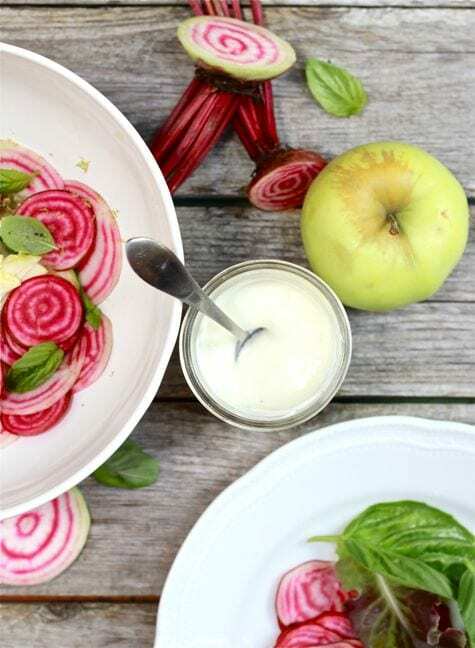 Add the beets and apples to the bowl. Add a little dressing and season with salt and pepper. Let it sit for 10 minutes or so to soften. Tear up the basil leaves. Add the basil and salad leaves to the bowl. Give it a good toss and taste to see if it needs more seasoning or dressing. Evenly sprinkle the lime zest on top. * Refrigerate any extra goat cheese dressing in an airtight container. It will keep for about a week. Beautiful salad Emilie, both the colours and the flavours. Heirloom vegetables always seem to look better – and taste better! 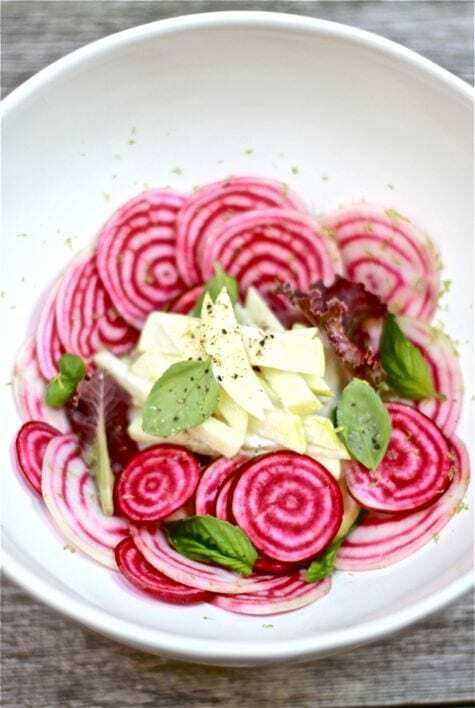 I am a fan of raw beets – they’re rather nice grated in a simple salad of mixed green leaves. Gorgeous post, will keep my eyes open for this variety! Hi Mrs M! Thank you so much. I really hope you can find this variety. They are absolutely stunning. What kinds of beets do you have by you? Hi Celia! I have to say, I was very hesitant to try the raw beet. But the Chioggia variety was definitely mild. The dressing softened it a bit, and when thinly sliced the flavor wasn’t overwhelming. I haven’t tried any other variety raw, so if you do I’m curious to know how it goes! I have always hesitated when it comes to beets, but I tried my first raw beet today. Fortunately, my local farmers market was selling Chioggia beets. I’m glad I didn’t ruin my first experience with raw beets by getting the dirt like flavor of the regular beets, instead I got a delicious, mild beet that will urge me to try them again. I can’t get over how gorgeous this dish is!